A box of 12 Blackwing 602 (silver-grey) pencils - the hardest of the 3 standard Blackwing pencils, although also the most similar to the original. Originally developed by Eberhard Faber in the 1930s the Blackwing featured a specially developed lead containing wax as an addition to the typical graphite clay formulation. Claimed to require half the effort to produce a mark it quickly became a favourite of writers, musicians, and storyboard artists. 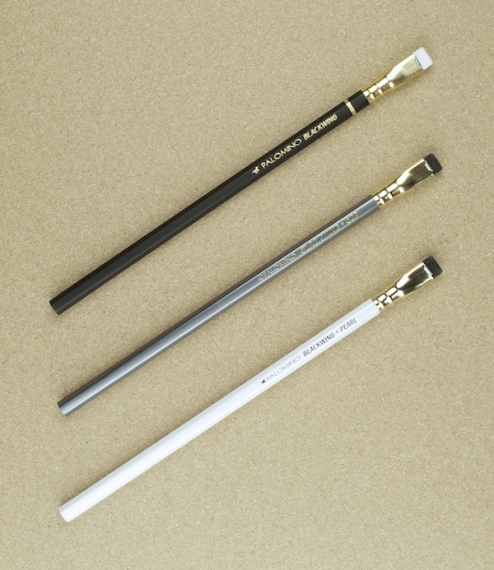 Discontinued in 1998 apparently after the eraser clip manufacturing machine broke, it was reintroduced in 2010 by the Cal Cedar Pencil company as the Palomino Blackwing. Made in Japan of sustainably forested Californian incense cedar the Blackwing is considered by many perhaps the World’s finest pencil.